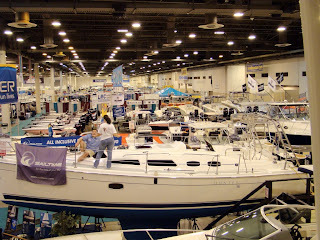 Often ones first introduction to boating is at one of the many, many boat shows that are staged around the country almost anytime of the year. Some of the largest are in-the-water shows in Annapolis, Miami/Fort Lauderdale and several other venues in coastal cities and inland waterways. But there are quite a few others that are held in convention centers, stadiums and coliseums in cities both large and small. When the doors open and the first of thousands of folks walk through the door, the boats are gleaming and polished, the booths are dressed for customers and the sales folks have practiced their presentations. We are back home from the Stuart Cruiser's Expo Show and it is always good to be home but we sure enjoyed the great weather (read warm) and the opportunity to spend some time with a lot of current and future cruisers. This is pretty much a power boat cruiser's show but there were a few sailors there also. We heard from several other venders that the show did not have the same attendance as in past years but we found it to be a good show from our perspective so we look forward to doing it again. 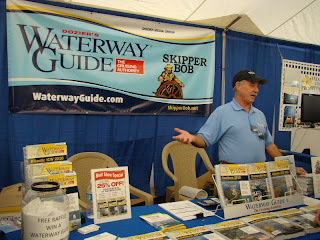 We were at the Waterway Guide booth through most of the weekend. We met a lot of folks and sold a lot of Waterway Guides. 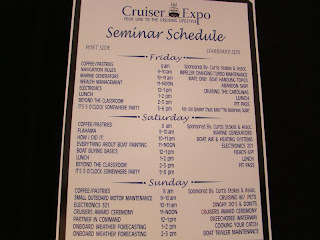 On Friday I gave a seminar on cruising the Carolinas and it seemed to be well received. We talked about and covered side trips to many small towns that can be visited off the ICW by boat and how these trips make great alternative stops and cruising grounds. Capt. 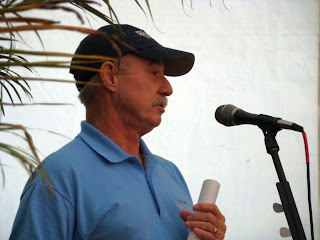 Chris Caldwell also joined in and gave a brief presentation on one of his favorite routes along Croaton Sound and how it can be used as an alternative to the ICW route. On Friday evening there was a cocktail and hor'dourves party and I was asked to be the Keynote Speaker. It was a fun speech and kept short since everyone was having too good a time to listen to a speaker for very long. There was lots of socializing and tall tales going around the room for hours. The sponsors and organizers put on a great spread and did a fine job for the entire weekend. We really enjoyed it and hope we will be participating again next year. 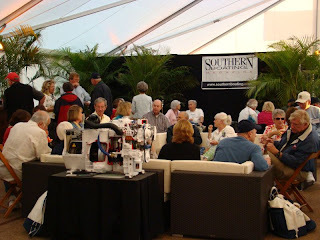 The immediate future will have us perhaps at the Trawlerfest in Ft. Lauderdale, The Miami Boatshow, and for sure the MTOA Rendezvous in St. Augustine in April. I plan to give a talk on cruising Cuba at the MTOA event. For now, it is back to work to fatten the bank account and get the cruising kitty built up. We have lots of expensive equipment to buy and install so this may be one of our longest work stops yet. We are having a great time with the new jobs and spending much more time with family, so other than the winter and the cold, there is not too much to complain about. But I will anyway. 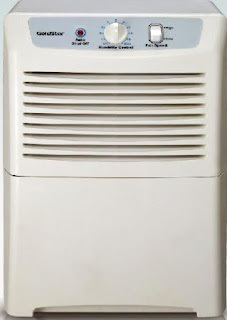 The U.S. Consumer Product Safety Commission has issued a recall of 98,000 dehumidifiers sold under the Goldstar and Comfort-Aire brands between January 2007 and June 2008. The model in question, manufactured by China's LG Electronics Tianjin Appliance Co., has a 30-pint resevoir with a front-loading bucket, and a red shut-off button. This unit has been determined to be the cause of a number of fires — and we all know how boat fires usually turn out. To see if your dehumidifier is on the recall list, check this site. Fishing vessel safety staff in the Coast Guard’s Seventh District has received at least three reports in the past few months regarding unapproved replacements of 406 EPIRB batteries by servicing companies having no association with the EPIRB manufacturer. These unauthorized battery installations would likely result in a failure of this critical item of lifesaving equipment, and as such are not in compliance with the operational readiness requirements of 46 CFR. Every approved (i.e., accepted by the FCC) EPIRB is tested during its approval process using a battery, or batteries, specified by the manufacturer. Approved EPIRBs come with a user's manual which describes battery maintenance and replacement procedures. 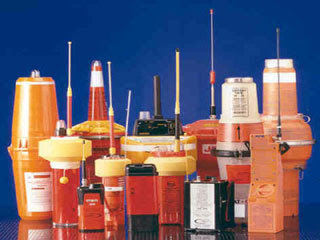 In order for the EPIRB to remain within the conditions of its approval, the manufacturer's instructions in the user's manual must be adhered to. To ensure that replacement batteries are of the same type with which the EPIRB was approved, and are correctly installed, manufacturers typically specify that battery replacements only be done by the manufacturer or a manufacturer-approved shop. Any modification or changes to an EPIRP must be made in accordance with the manufacturer. The use of alternative replacement parts or batteries is prohibited and may prevent the device from meeting lifesaving requirements. The Coast Guard strongly reminds EPIRB owners and servicing facilities to be aware of the compliance implications and potential for equipment failure stemming from any EPIRB modification or unauthorized battery replacement. This safety alert is provided for informational purposes only and does not relieve any domestic or international safety, operational or material requirement. Questions regarding the information presented in this alert may be addressed to LCDR Vince Gamma of the U.S. Coast Guard Headquarters Lifesaving & Fire Safety Standards Division at 202.372.1396 or Vincent.A.Gamma@uscg.mil.